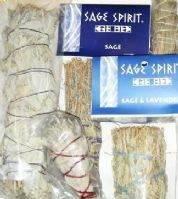 Smudge Sticks are dried sage bundled together and tied with twine. As you move through the space wafting the sacred smoke, the smoke transforms negative energy into positive and drives away any unwanted energetic influences. Each smudge stick comes with an instructional leaflet, giving you the basic information to do your own space clearing. 4 Directions 8" Smudge Stick: Sweetgrass, Sage, Juniper & Sage Flower Mix by "Fluorescent Ranch"
6 Mini Sage Smudge Sticks & Feather by "Sage Spirit"
Black Sage 7" Smudge Stick by "Fluorescent Ranch"
Blue Sage "Grandmother Sage" & Dragon's Blood 7" Smudge Stick by "Fluorescent Ranch"
Blue Sage "Grandmother Sage" & Mandrake Root 7" Smudge Stick by "Fluorescent Ranch"
Blue Sage "Grandmother Sage" & Mistletoe 7" Smudge Stick by "Fluorescent Ranch"
Blue Sage "Grandmother Sage" & Palo Santo Smudge Stick by "Fluorescent Ranch"
Blue Sage "Grandmother Sage" & White Sage "Grandfather Sage" 7" Smudge Stick by "Fluorescent Ranch"
Blue Sage "Grandmother Sage" 10" Smudge Stick by "Fluorescent Ranch"
Chamisa 11" Smudge Stick by "Fluorescent Ranch"
Lakota White Sage Smudge Stick 12"+ by "Sage Spirit"
Sacred Feather Sage 9" Smudge Stick by "Native Sage"
Sage & Cedar Smudge Stick (4-5" Small) by "Sage Spirit"
Sage & Cedar Smudge Stick (6-7" Large) by "Sage Spirit"
Sage & Copal Smudge Stick (4-5" Small) by "Sage Spirit"
Sage & Copal Smudge Stick (6-7" Large) by "Sage Spirit"
Sage & Lavender Smudge Stick (4-5" Small) by "Sage Spirit"
Sage & Lavender Smudge Stick (6-7" Large) by "Sage Spirit"
Sage & Pinon Pine Smudge Stick (4-5" Small) by "Sage Spirit"
Sage & Pinon Pine Smudge Stick (6-7" Large) by "Sage Spirit"
Sage & Sweetgrass Smudge Stick (4-5" Small) by "Sage Spirit"
Sage & Sweetgrass Smudge Stick (6-7" Large) by "Sage Spirit"
Sage Smudge Stick (4-5" Small) by "Sage Spirit"
Sage Smudge Stick (6-7" Large) by "Sage Spirit"
Silver Sage Smudge Stick by "Fluorescent Ranch"